Warning! The following post may not be suitable for vegan eyes or people who think raw chicken looks icky. I’ve seen, and made, recipes similar to this one. In comparison, I think this stuffed chicken left a little to be desired. Don’t get me wrong, it was good, and really easy, but I’ve done better. Maybe you’ll have some suggestions to improve the dish, or at least take note of my thoughts so you can try it a different way. 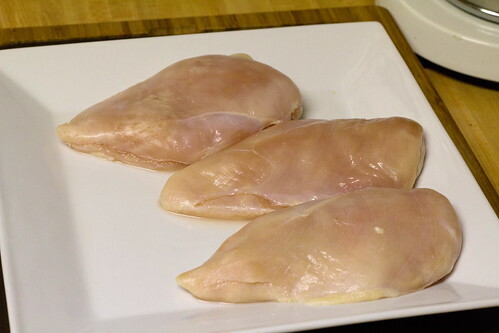 I started with three boneless, skinless chicken breasts because there are three of us. Don’t worry, I’m sure they didn’t come from the same chicken! If there are four of you, use four, etc etc. 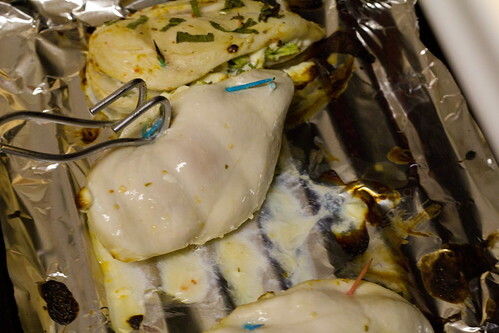 It’s important that if you are using frozen chicken that you thaw it completely, so that you can perform the next step. This may be the most unappetizing thing I’ve ever done. I’m sorry. It’s gonna taste much better than it looks! 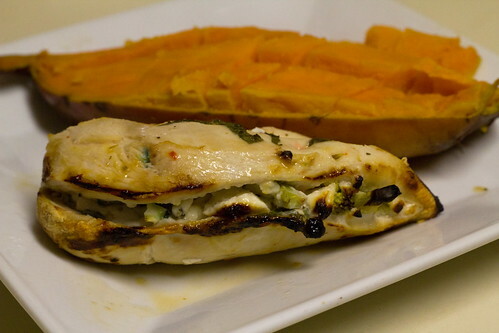 Slice the chicken breast down the middle, almost all the way through. This is a much more appetizing shot. 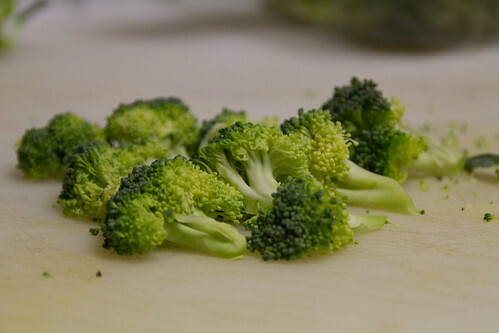 With a clean knife, on a clean cutting board, chop some broccoli and some fresh basil. Sorry for the blurry photo. I was too excited by the feta to focus the camera. For extra credit, throw some chopped basil on the top. 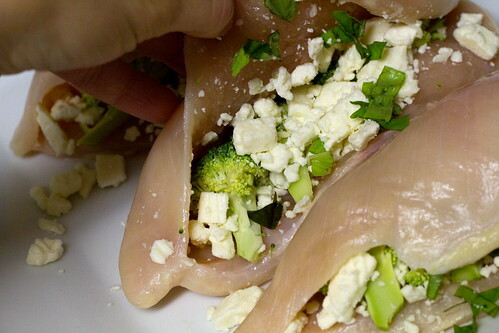 After about ten minutes, flip each breast over, brush with more dressing and top with basil. You’ll need to watch the chicken from this point on. It could take anywhere from another six to ten minutes before the chicken is totally cooked through. You don’t want to overcook it and loose all the moisture, but you definitely don’t want pink chicken, either. When you think it’s ready, carefully cut into one of the breasts. I usually choose the thickest one, since that’s the one that will take the longest. When the meat is white all the way through, pull ’em out. 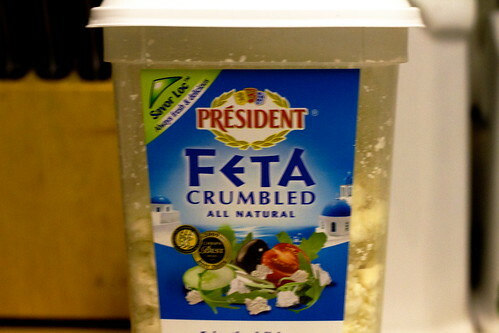 See how the feta is all melty? And the outsides are still moist? Yep, ready to eat. Don’t forget to remove the toothpicks. On a side note, Holy Sweet Potato, Batman!! 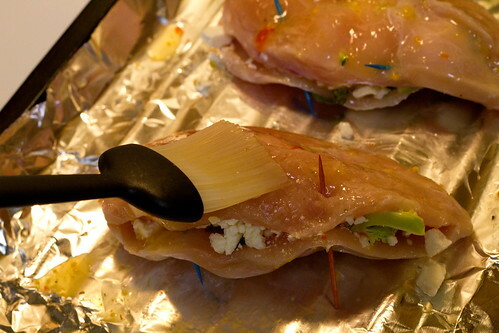 And for future reference, blue toothpicks will turn your chicken blue. 2. Sometimes, the outside of the chicken can get a little…rubbery when only Italian dressing is used. Almost every other recipe I’ve seen will tell you to bread the chicken before baking. We all know how I feel about breading, so I usually skip that part, but I think it really would have worked here. 3. 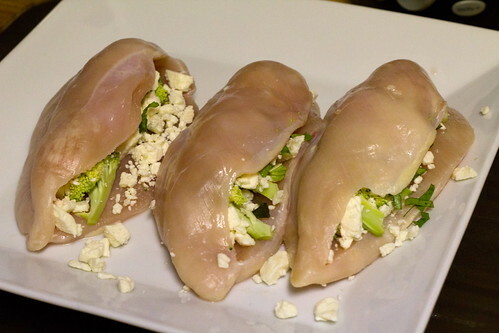 The other version of this recipe I make, affectionately known in my family as “Crack Chicken”–because it’s so addictive, uses cream cheese and pesto in place of feta and broccoli. I think the flavors in that version complement each other a little better. 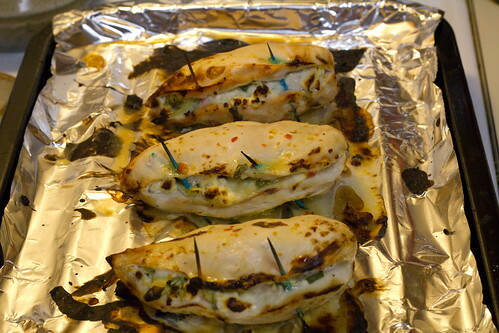 The process is exactly the same, you just stuff equal amounts of cream cheese and pesto in each breast. All in all, this is a great recipe to keep in your arsenal. It would be ridonkulously easy to make a single serving if you’re cooking for your onesy, but you can also multiply it to serve as many as needed. I hope you try it, and let me know your favorite version!